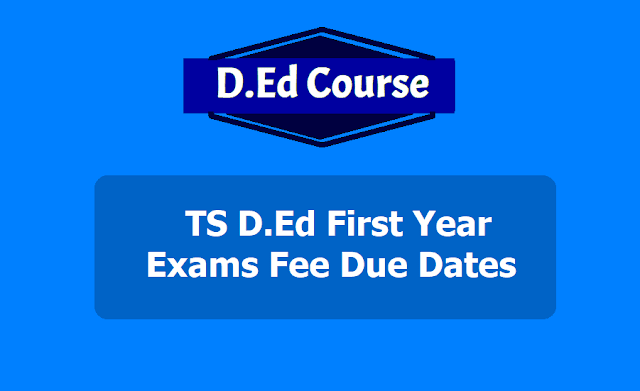 BSE Telangana, TS D.Ed First Year Exams Fee Due Dates for D.Ed 2018- 2020 Batch, TS D.Ed 1st Year 2016-2018 Batch Examination Fee Due Dates Notification; Office of the Director of Government of Examinations, Telangana has given D.Ed First Year 2018-2020 Batch Examination Fee Notification and DGE, Telangana has informed that the D.Ed 1st year Examinations of 2018-2020 batch will be conducted in the month of April 2018. D.Ed I Year 2018-2020 Exam Time Table will be announced soon. The failed candidates with regard to Theory / Internal/ Practicals /Records in earlier batches are also eligible to appear for these Examinations as private candidates. DGE Telangana: It is hereby notified that the D.El.Ed 1st year Examinations of 2018-2020 batch will be conducted in the month of April 2019. The Examination will be conducted as per the modified syllabus and scheme approved by the Government. The failed candidates in earlier batches are also eligible to appear for these Examinations as private candidates, with old syllabus as a final chance. No further Examination will be conducted with old syllabus. The due dates for remittance of Examination fee are given below. The Examination fee is Rs.150/-for regular candidates. The fee has to be remitted separately for regular & once failed candidates through separate consolidated challans in the Government Treasury to the following Head of Account. The Examination fee is Rs.150/- for regular candidates. The fee has to be remitted separately for regular and once failed candidates through separate consolidated challans in the Government Treasury to the following Head of Account. Regular candidates list shall have the approval of the Convener, DEECET.